It's easy to save cash with Esnoz vacation packages on Expedia. You'll have plenty more time to arrange the exciting stuff — and more spending money! Crafty travelers can save up to 42%* by getting a package deal on Expedia. Our comprehensive international database features more than 321,000 properties worldwide and 400 partner airlines. With such a great range of options, planning your dream vacation will be a breeze! Can't wait for your trip to Esnoz? After a few hints about what to do and see when you arrive? That's where we can assist! If you're up for a little spiritual enlightenment on your travels, pay a visit to Colegiata de Santa Maria. Who knows, you may even glimpse the answers to one or two of life's most mystifying questions! There's a fabulous range of things to keep you busy close by. Escape the sounds and smells of the city and take a leisurely drive through the windy roads of Puerto de Ibaneta. Not only will you get to enjoy superb views and crisp, clean air, you'll also get to taste some of the yummy local produce! Still have some time to spare? People have said, "The job of the artist is always to deepen the mystery." Marvel at the intriguing works at Jorge Oteiza Museum, and take a moment to imagine the story of each piece. Expedia presently has no property listings for Esnoz. However, you can find a few places to stay just 9 miles (14 km) away in Urepel. The Erreguina and Hôtel Saint Sylvestre are among the most popular options in Urepel. The airport probably won't be the most exhilarating moment of your getaway, but there's nothing like the excited thrill of knowing that your well-earned trip to Esnoz is just a plane ride away! Once you unbuckle your seatbelt at Pamplona Airport (PNA), you'll be 16 miles (26 km) from the heart of town. Situated in Erro, this country house is 7.8 mi (12.6 km) from Dolmen Arregi and within 16 mi (25 km) of Colegiata de Santa Maria and Monumento a Roldán. Puerto de Ibaneta and Real Fàbrica de Municiones de Eugi are also within 20 mi (32 km). Situated near the airport, this hotel is 0.2 mi (0.4 km) from La Morea Shopping Center and 2.4 mi (3.9 km) from Plaza del Castillo. Navarra Arena and El Sadar Stadium are also within 1 mi (2 km). 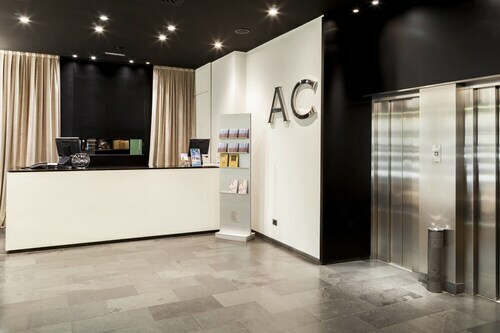 Located in Pamplona City Centre, this hotel is within a 5-minute walk of Parroquia San Lorenzo, Palacio de Congresos and Auditorium of Navarra, and Iglesia de San Nicolas. Parque de la Taconera and Ciudadela are also within 10 minutes. Pamplona-Iruña Station is 22 minutes by foot. 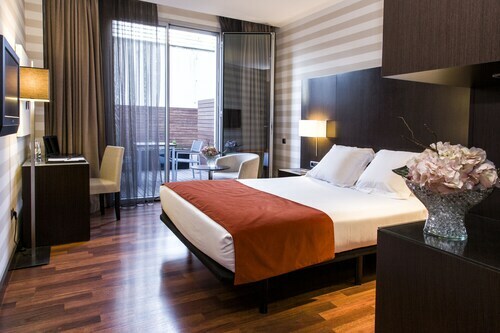 Located in Iturrama, this hotel is within 1 mi (2 km) of University of Navarra Musuem and Plaza del Castillo. Yamaguchi Park and University of Navarra are also within 15 minutes. 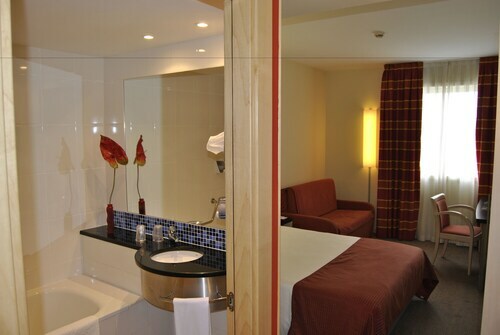 Located in Old Town, this spa hotel is steps from Café Iruña and Plaza del Castillo. Camara de Comptos de Navarra and Palacio de Navarra are also within 5 minutes. Pamplona-Iruña Station is 27 minutes by foot. 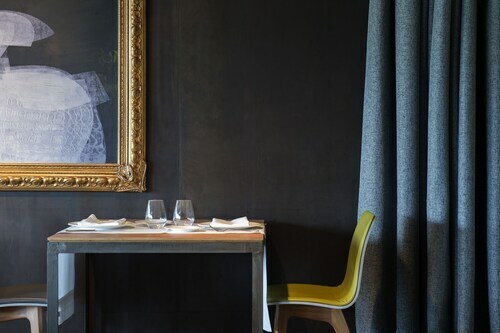 Located in Old Town, this boutique hotel is steps from Camara de Comptos de Navarra and Plaza del Castillo. Church of San Saturnino and Pamplona City Hall are also within 5 minutes. Pamplona-Iruña Station is 24 minutes by foot. 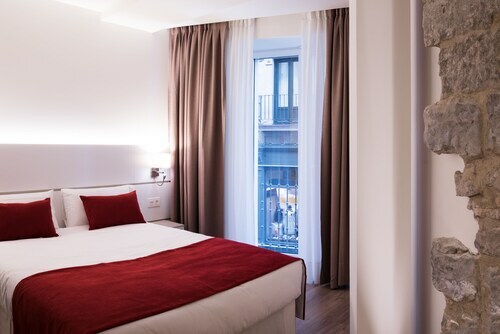 This family-friendly Pamplona hotel is located on the riverwalk, within 1 mi (2 km) of Pamplona's City Walls and Interpretation Centre and Plaza del Castillo. Café Iruña and Teatro Gayarre are also within 1 mi (2 km). 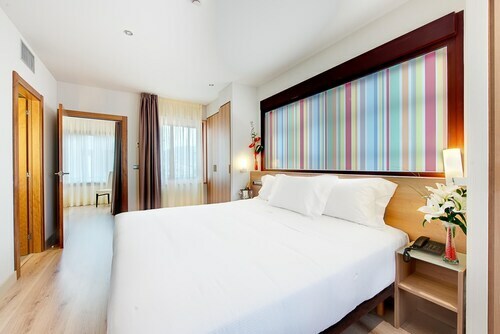 Situated in Pamplona, this hotel is 0.4 mi (0.6 km) from La Morea Shopping Center and 2.7 mi (4.4 km) from Plaza del Castillo. Navarra Arena and El Sadar Stadium are also within 2 mi (3 km).